Topsail Island is a relaxing and beautiful summer vacation destination. However, due to our location on the coast of North Carolina, we are vulnerable to hurricanes and tropical storms during hurricane season. Whether you’re a local, homeowner, or just visiting, here are a few quick tips you will want to know should a hurricane pass through while you’re in our area. Hurricane season begins on June 1st and ends on November 30th every year. Although hurricanes can form as early as May or as late as December, it is very rare to see a storm form in those months. During hurricane season, storms can range from tropical depressions, tropical storms, to category 1-5 hurricanes. Tropical Depression Up to 39 mph Rough seas, small craft warnings. Tropical Storm 39 – 73 mph Heavy seas, capsizing of smaller vessels, flooding of low areas, heavy rain. A tropical storm is considered a hurricane when winds reach 74 miles per hour. Category 1 74-95 mph Very dangerous winds will produce some damage. Well-constructed frame homes could have damage to roof, shingles, vinyl siding and gutters. Large branches of trees will snap and shallowly rooted trees may be toppled. Extensive damage to power lines and poles likely will result in power outages that could last a few to several days. Category 2 96-110 mph Extremely dangerous winds will cause extensive damage. Well-constructed frame homes could sustain major roof and siding damage. Many shallowly rooted trees will be snapped or uprooted and block numerous roads. Near-total power loss is expected with outages that could last from several days to weeks. Category 3 111-129 mph Devastating damage will occur. Well-built framed homes may incur major damage or removal of roof decking and gable ends. Many trees will be snapped or uprooted, blocking numerous roads. Electricity and water will be unavailable for several days to weeks after the storm passes. Category 4 130-156 mph Catastrophic damage will occur. Well-built framed homes can sustain severe damage with loss of most of the roof structure and/or some exterior walls. Most trees will be snapped or uprooted and power poles downed. Fallen trees and power poles will isolate residential areas. Power outages will last weeks to possibly months. Most of the area will be uninhabitable for weeks or months. Category 5 157 mph or higher Catastrophic damage will occur. A high percentage of framed homes will be destroyed, with total roof failure and wall collapse. Fallen trees and power poles will isolate residential areas. Power outages will last for weeks to possibly months. Most of the area will be uninhabitable for weeks or months. What Should I Do When A Hurricane is Expected? There are two different types of storm notifications: a hurricane watch or a hurricane warning. A Hurricane Watch means that hurricane conditions are possible in the area and are normally issued 48 hours prior to expected storm arrival. A Hurricane Warning means a hurricane is expected in the affected area and is normally issued 36 hours prior to the storm arrival. 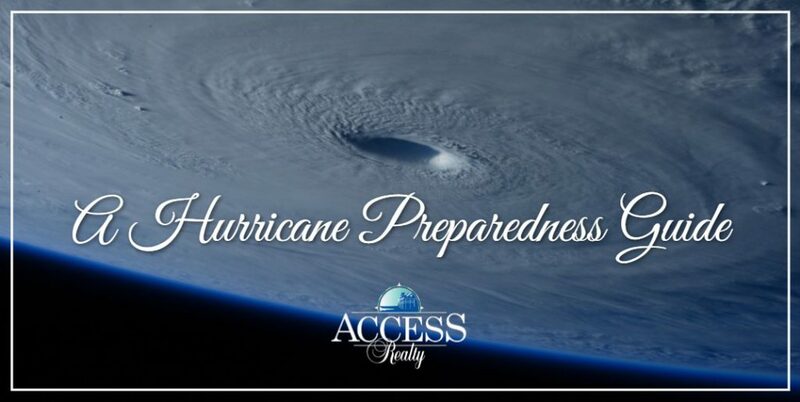 Whenever a hurricane threatens the Topsail Island area, Access Realty will be in touch with you regarding our plan of action. For all residents and guests visiting during this season, you should have a plan in place in the event there is a mandatory evacuation in our area. Should a mandatory evacuation take place, you have the option to either head inland and stay in a hotel or return back home. Before you leave, make sure you have all of your belongings, necessary medications, gas, etc. When the storm passes, you can call our office to see if you are able to return to the home and enjoy the remainder of your vacation. Preparing a kit in advance will ensure you are able to collect the necessary supplies before the shelves are emptied. Your kit should include (at minimum) flashlight(s), batteries, cash, and first aid supplies. You can find more information on hurricane kits here. If the storm is looming and you absolutely could not evacuate the area, stay indoors. Stay away from all windows as flying debris could break the glass. Make sure you have your necessary supplies from your hurricane kit readily available, as well as plenty of bottled water and non-perishable food. Also, make sure your cell phone is fully charged in the event there is a power outage so that you can contact family and friends. National Hurricane Center – Track storms in the Atlantic and get up-to-date information on current and future storms. Ready.gov – Find hurricane kit checklists and helpful information to prepare you in the event of a storm.